It’s National Volunteer Week! SAFE Project would like to thank everyone who volunteered their time, talents, and support during our first year. We could not have made it here to Year Two without your help and inspiration. Because of you, we launched our “SAFE Community Playbook” to help communities organize coalitions that make a difference in their community. Because of you, we have been able to hold Collegiate Recovery Academies in DC, CO, NC, and MN providing college students in or seeking recovery assistance for substance use disorder with the information needed to create and strengthen efforts on their campuses and develop leaders. Because of you, we have been able to educate communities about the benefits of the lifesaving drug naloxone. This is only a small sample of the things that we’ve accomplished — and will continue to accomplish — because of your dedication and inspiration. With the support of our volunteers, we are excited to continue our mission building SAFE Communities and SAFE Campuses — and there are many great opportunities coming up nationwide. 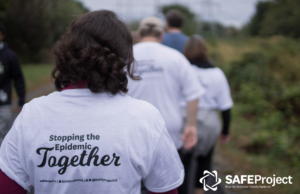 If you would like to become a SAFE Project volunteer, or know someone who might want to get involved, you can get more information and register here.